Founded in 2012, we are a member chorus of the Lakeland Choral Society. We are funded by membership tuitions, concert ticket sales, and donations from the community. Florida Southern Children's Chorus and all components thereof seeks to introduce children to the world of musicianship and performance of high quality literature and to develop a love of music-making that will go with them for a lifetime. 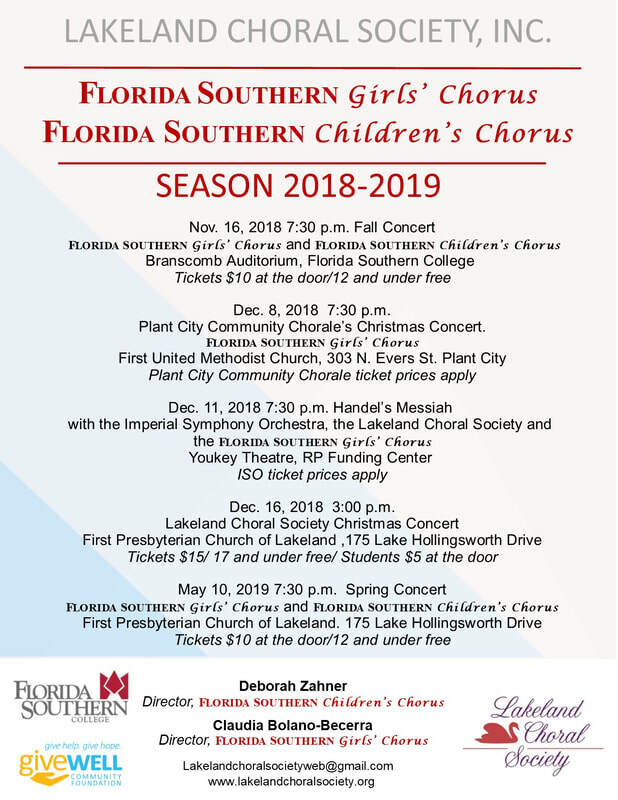 Florida Southern Children's Chorus is a broad-based community organization dedicated to leading children to discover the joy of performing quality music at the highest level of artistic excellence possible. Children of all religious, ethnic, cultural, and economic backgrounds are encouraged to join together to create musical experiences, both in rehearsal and in performance, that will be life-enriching and, in some cases, life-changing. Through performance-based music education, we intend to create an artistic atmosphere which will foster the personal, intellectual, and social growth of the young musicians. The children will also serve as ambassadors representing our community at the state, national, and international levels. We take this challenge knowing full well that we have the opportunity to have a great impact on the lives of children and on the quality of life in our community. Auditions are held each summer as well as mid-season. We rehearse on the campus of Florida Southern College and our rehearsals take place each Tuesday afternoon from 4:30-6:00 pm during the academic year. Additional monies are needed to purchase formal performance attire. If you have a singer who may be interested in joining us, contact Deborah Zahner at 863-604-9161 for more information or via email. ​Please click here to download a Membership form, which you will need to print and fill out completely to bring to your audition.